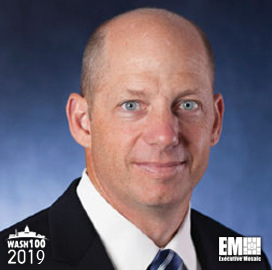 Executive Mosaic is pleased to introduce John Heller, CEO of PAE, as an inductee into the 2019 Wash100 — Executive Mosaic’s annual selection of the most influential voices in the government contracting arena — for securing several major contracts and investing in emerging technology. This latest honor marks the fourth Wash100 Award win for Heller. PAE obtained a position alongside 19 other companies on a potential $12.6B contract vehicle with the U.S. Navy for military aircraft support services. Heller explained that the Contracted Maintenance, Modification, Aircrew and Related Services will help PAE invest in sustainable technology platforms and expand its capabilities to address customer demands through the CMMARS IDIQ contract. “This is a large-scale, whole-platform support contract that constitutes the overwhelming majority of non-manufacturing aviation support for the Navy over the next 11 years,” Heller said. Heller also helped secure a potential $75M contract with the Department of Homeland Security in January to support the department’s Countering Weapons of Mass Destruction Office in detecting biological threats. Heller said the contract win boosts the company’s growing number of professionals who specialize in technology platforms designed to help the U.S. government counter chemical, biological, radiological, nuclear and explosive threats. In 2018, PAE won spots on two major indefinite-delivery/indefinite-quantity contracts including a potential five-year, $2.4B Enterprise Training Services award in October to provide training support to the U.S. Army and a potential $970M contract in June to help the Defense Threat Reduction Agency in its efforts to mitigate threats from weapons of mass destruction. PAE secured a potential $423M task order in 2017 to provide aircraft maintenance and support services to the Colombian national police’s aviation component as part of a State Department anti-narcotics and law enforcement initiative in South America. Under Heller’s leadership, PAE completed several major acquisitions, expanded its portfolio to include the national security sector and increased its revenue from $1.6B to $2.5B. Heller became CEO in December 2013 after serving as the senior vice president and chief operating officer of Engility, L3 Communications’ spin-off company. Prior to Engility’s creation, Heller served across various leadership roles at L3, Harris, Netco and Multimax, a portfolio company of Cerberus Capital Management. Heller also leads efforts to support charity programs, particularly those in the Washington, D.C., area. He received recognition not only for his contributions to the industry but to the academe and community as well. Executive Mosaic congratulates John Heller and PAE for receiving a 2019 Wash100 Award. The Wash100 award, now in its sixth year, recognizes the most influential executives in the GovCon industry, as selected by the Executive Mosaic team in tandem with online nominations from the GovCon community. Representing the best of the private and public sector, the winners demonstrate superior leadership, innovation, reliability, achievement and vision.